Many local and national businesses rely on M&J Truck and Auto Repair to keep their truck and auto fleets in good repair and on the road. U-Haul, Penske Corp., UPS Freight, Charter Communications and the Blooming Grove Fire Department are just a few of the businesses that M&J counts as customers. Originally started by Peter Maly and Marvin Johnson, the business opened Nov. 1, 1982, on Stoughton Road. Maly was a heavy truck mechanic and Johnson an operator of heavy trucks prior to starting the business. After four years, in 1986, Maly and Johnson built a new building on the opposite side of Stoughton Road where the business remains today. 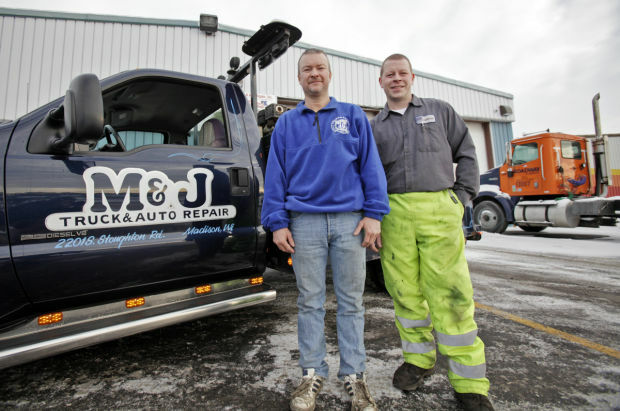 M&J provides preventive maintenance, engine overhauls or replacements, 24/7 on-call service and pickup and delivery of fleet customers vehicles. They also provide rental space for fleet accounts to plug in their vehicles during the winter. Free loaner cars to customers and special fleet account pricing are also offered. They work on a variety of vehicles, including cars, trucks, motor homes and semi-trailers, and are open extended hours 7 a.m. to midnight, Monday-Friday. M&J now stands for the second generation of Malys to run the business as brothers Matt, 38, and Jon, 34, serve as general manager/vice president and operations manager/vice president, respectively. Matt earned his technical degree and an associate’s degree in business management from Nashville (Tenn.) Auto Diesel College and joined the business in 1994. Jon received his technical degree from Universal Technical Institute in Lisle, Ill., and began working for the company in 1998. Peter Maly served as president until his death in 2011. Peter’s wife, Jeanne Maly, is now the company’s president. Marvin Johnson left the business in 1993. His son, Bob Johnson, has been a truck technician at M&J since 2006. Nine people are employed by the business. Matt Maly said that being able to help people that are in need of a positive repair shop customer relationship is one of the things that motivates him. “We treat every customer as if they are the most important customer, no matter if it’s the family car or a fleet of thousands”, Matt Maly said.